Notes: Based on the manga by Oku Hiroya. The release schedule (2 episodes per disc) is on par with the Japanese release schedule, as this was a stipulation of the licensing agreement. Note that while this series was edited on Japanese television, the DVD is of the unedited, uncut version. Although this was written at a later point than Christi's take on the series, it is the first complete review we have and thus supplants the older, incomplete review. The last thing Kei remembers is the train running over his body. 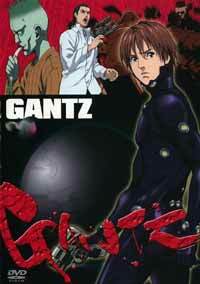 Now he is in a room filled with strangers, all resurrected by the featureless black sphere known only as the Gantz. But their reprieve from death may only be temporary, for unless they undertake the brutal missions that the Gantz assigns, all of them will die again. While Gantz, directed by Ichiro Itano (whose other directorial works include Violence Jack), can generally be looked at as a show about how society has had a progressive desensitization to violence and public responsibility, it can also be viewed as a somewhat exaggerated look at society's disdain for immediate action in circumstances that require it ... or I can be led to think this way mainly because of Itano's various problems with pacing. As most of the major events of the series center around these "games" (which is actually an insulting way to put things ... had the viewer been taking the show too seriously) the characters participate in, the "contestants" are usually given up to an hour to go around and kill conceptually-abstract aliens that can be found in a supposedly semi-alternate reality of Tokyo, all the while contemplating a bunch of common new age societal problems. Therein lies the dilemma with Itano's pacing; the flow of time and space is magically drawn out so much that it takes on average more than the one-hour time-limit to bring things to a proper close. And judging from how indecisive the people in the series tend to act, one would think that there'd be so many complex choices to make in the different situations throughout the series, when in truth, it simply boils down to either doing something or not doing something (looking back at the first episode, "do I pull the smelly bum off of the train tracks or not? "); when I think about it, even the people who supposedly don't want to participate in the "games" take just about forever to make a decision on the matter. Setting all of that aside, while Itano could've thought of a better way to compress all of these things, I was ultimately very impressed at how coordinated and organized everyone's general line of thought was; it would seem that Itano actually knows how to tackle a fairly confusing process (i.e. the human thought process) and not go around in circles while interpreting it. The excessiveness of detail though does pretty much kill the tension of the buildup as far as what my gut has been telling me, but I'm not sure if I'd really be willing to give up that detail given how entertaining it was to watch unfold. At this point, I can imagine that a few eyebrows are now being raised as I seem to move towards the sentiment that Gantz is entertaining in an amusing sense; well, it is. While one should tend to feel bad for laughing during several instances of the show, what's happening is that I felt cheated into the logic of Itano's message of society's insensitivity; contrary to what most might think, I thought that most parts of the series were purposely set up to be as funny as possible even though the show seems to pass itself off as some serious foray into compelling human drama most of the time. For example, in Satoshi Kon's TV series Paranoia Agent, there is an episode where Kon satirizes suicide. But the reason why it worked so well was because I actually had reservations about laughing and that Kon was able to tie it in with a meaningful message about the folly of suicide by the time the credits rolled down the screen that same episode. Itano sort of tries to do the same thing with Gantz, but ended up making things so that I didn't feel the need to hold back while laughing; thanks due to in no small part of Gonzo's awkward animation for the series. In the end, the shallowness of the black humor in Gantz, while fun, does have a generally negative effect on the very serious scenes as I found myself losing interest in them all too easily (especially towards the end of the third "game"). But then, maybe I would've actually been offended by most of the humor and more afflicted by the serious scenes had the execution not been so overdone in the first place. While my general observations hold up for most of the series, I have to admit that the last five episodes were truly intense (albeit contrived). For starters, Itano was able to tighten things up more by improving the pacing. He also made the tension actually feel a lot more genuine (even with the black humor and to the extent where he didn't need those unnecessary shots of the "Gantz-clock"), not only that, but the overall conflict was actually really interesting as well. Even though the last episode was blatantly preachy, I was swept along because of the immense energy put into it ... Unfortunately, it all ends in disaster as the last half of it becomes so abstract, that I barely walked away with a decent interpretation of what the hell Itano was getting at. It didn't really seem to bother me in the end though since I was literally tired out by the time I got there, but still, that is considerably bad. On a more positive note though is ADV's English language dub production. Directed by long-time ADV regular Matt Greenfield, Gantz is a show whose English production sports general acting that is strikingly dynamic and brilliant. And given the number of characters that actually appear in the entire series, it's amazing how consistently great all of the performances have been, even during the parts of the show that I didn't really like. The way Greenfield went about directing the cast's appropriate level of projection and making sure that everyone was up to speed during every scene deserves high praise; I don't think I've ever heard a dub with so much energy being tossed around, yet flowed as smoothly as crystal-clear river-water. In hindsight though, I don't think I've ever heard so much swearing in a dub production either, but I found it to be a lot of fun yet eerily appropriate (and colorful, thanks to inspired scripting choices). A few issues (one or two of them glaring) can be raised about the script, but that's beside the point; performance-wise, Matt Greenfield's dub is a home run and the Ayres brothers are simply spectacular. Looking back on my initial impressions of the show, I was rather unimpressed with the subject matter given how haphazardly most of the production was tossed together; coupled with an atmosphere that's about as thick as Hollywood actresses on Anorex, this doesn't exactly make for a pleasant viewing experience. I don't know what happened, but it eventually dawned on me at one point, about 4-months later, that I was taking the wrong approach towards enjoying the show; I was taking everything too seriously, when it seems that the way that some of the direction was done suggests otherwise. While most people in the end are likely to call this show crap, I'll take a different stance and be the person who calls it fun crap; Gantz is easily one of my true guilty pleasures. Recommended Audience: A hard R for extreme violence, sexual content, and very mature themes. Not for the squeamish - you almost have to be a sick, twisted individual to want to watch this, thanks to the main theme of the show.